"Bernie" tells the real-life tale of assistant funeral director Bernie Tiede, living in the rural town of Carthage, Texas. As we open the film, we see that Tiede was one of the town's most beloved residents. He taught Sunday school, sang in the church choir and was always willing to lend a helping hand. Everyone loved and appreciated Bernie, so it came as no surprise when he befriended Marjorie Nugent, an affluent widow who was as well known for her sour attitude as her fortune. Things go fine for a while, but eventually Marjorie pushes Bernie just a little too far, and he snaps. And the interesting part of this tale is what happens next. I'll try and refrain from discussing the ending of the film in specifics, just for viewing sake, but I hardly feel like it's giving away spoilers since this is based on a true story, and anyone could have looked up details on this at any point. But if you're completely unfamiliar with this story as I was, I'll spare you the final act. Instead, I'll focus more on the construction of the film and how I thought it played out. 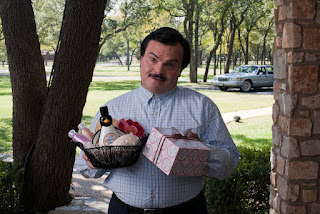 First off, Jack Black took the lead role of Bernie Tiede here. There are plenty of normal Jack Black antics throughout - they manage to get him ample screen time for his singing - but overall, I was actually really impressed with his performance. Though not much else comes to mind even as a contender, this is the best performance I've ever seen from him. Black did a really good job getting me to understand the kind heart of this character, and why so many people of the town loved him. There are a lot of layers here that Black almost effortlessly portrays. Black really seems like he was a perfect choice here, and so many of this man's antics and tendencies played perfectly into Black's own repertoire. If you don't have any interest in anything I have to say about the film from here on out, I think this film is worth a watch for nothing more than Black's performance. I possibly should have mentioned the setup of the film earlier, but I really did want to start with Black's performance, as I thought it was the highlight of the film. But the layout of this film was fairly unique, and I thought it played pretty well. As I've stated, the film is based on a true story, and in turn, is laid out as half documentary, half Hollywood character study. All of our main characters are played by real actors, but throughout the film, there are various talking head interviews with different real-life people from the town who knew and cared about Bernie. These kind of help to move us along from chapter to chapter, and help to keep the story fairly grounded. It was very interesting to see how real people felt about this man and the situations that ensued. It's hard discussing it without talking about the last act of the film in detail, but I'll just say what the film does so well is to help detail a person that seems like the nicest, most caring person in the world, and show that no matter who you are, every one of us has a dark side. The very real conflict presented to the town is a moral one that we the viewers go through as well. It's hard to see someone consistently acting one way but then know by reputation that they acted differently, and still try to give a fair judgment of them. The film is probably skewed slightly to make the conflict seem that much more...well, conflicting, but it's still an interesting study that you can't help but try and figure out which side you stand on. I love the ideas and thoughts that this film elicited, and I feel like it presents a very interesting and uncomfortable dilemma. Overall, the film is funny, but more subtle than you'd probably expect from a Jack Black film. But it feels pretty authentic, and I think that director Richard Linklater took his characters very seriously and really took his time in letting them breathe. It's an easy watch, and one that feels very awkward calling a "feel-good" film, but it plays exactly as such. And until the very end when we see a shot of the real Bernie Tiede, you get so caught up in the absurdity of the goings-on, that you forget and are again amazed that what you were watching unfold was based on very real events (don't over-hype that too much). I didn't know anything about this story going in, and even if it weren't for the unexpected turns the film takes later on (at first I just thought it was a quirky, ironic character study about a weird but loveable guy), I still would have enjoyed watching this. The cast is all spot-on in the film, and each of their personalities seem to mix perfectly with the story. I don't imagine a ton of future watchability here, but I don't think I'd have many problems with it either; I could watch Black as this character all day. I definitely think this film deserves a watch, and I think that most everybody can enjoy the performances happening within. It's not the most exciting film you'll see, but it's definitely one of the most unique. Great acting and great direction here make this film one of the better combos of skill and entertainment I've seen all year. That was going to be my closing, but I'm going to ruin it. I just can't hold in that final act anymore. If you were hoping to avoid the "twist", look away now. 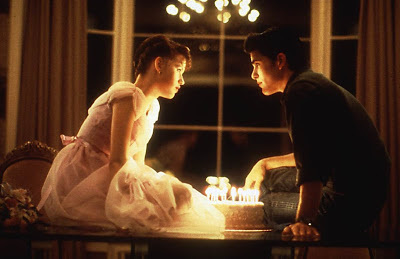 It wants so badly for me to write it and I can't hold it in anymore.....after being the overly nice guy for the majority of the film, he finally snaps, shoots her in the back four times, shoves her in a freezer, and lies to the town and her family about her still being alive for the next nine months. Phew. That feels better. Sorry if I ruined anything. It had to be done though; I'm surprised I made it that long. Even if you couldn't help but read what I had to say, the film shouldn't be ruined for you. There are still plenty of little intricacies throughout that make this film an enjoyable watch.